187 p., 6 ill., 14,7 x 20,8 cm. With contributions by Gerhard Fichtner, Wolfgang Martynkewicz, Rachel Rosenblum, Leslie Sohn, Samir Stephanos, Herbert Will and Ilka Winkelmann. An unprovoked assault occurs when a stranger assaults a totally innocent victim he has never met before. Presenting findings from three such cases, representative of a series of ten seen as part of his work as a psychoanalyst at a special forensic hospital in the UK, the author attempts to tie together the victim and his attacker in the attacker’s mind, setting out to explain how the victim fits the need of a psychotic man’s fantasy, at a particular time. Aprovisional hypothesis about the internal situation of such patients and its diagnosis, treatment and management is put forward and discussed, in the context of the implications for the treatment of such offenders and the psychoanalytic theory of projection and symbolisation. This paper engages with the fate of people who have suffered traumata from their earliest childhood. The accumulation of these traumata leads to the collapse of their character-neurotic defences. Consequently, they fall into a state of »dépression essentielle« (Pierre Marty), of vital depression, isolated and irreconcilable towards their environment. The author discusses his psychosomatic hypotheses, which are based upon the Paris School of psychosomatics. For the treatment of these patients he describes his analytic-psychosomatic model ward, at the heart of which lies the therapeutic team. Further, he presents an ambulatory variation of the ward-setting for the treatment of traumatised patients. This is structured around episode work and the successive construction of the patient’s life-history. The author uses fictitious narration to communicate his hypotheses to the patient. The healing process begins with the recognition of the »bad« (Samuel Beckett) and its aim is the reconciliation of the patient with himself or herself and his or her objects, which has to take place first of all in the therapist’s own inner world. In a former paper the author showed that it is safer for the survivors of the shoah not to speak directly about their holocaust experience, but to use other’s words to do so. In this text, she deals with a mirror-inverted process, in which the symbolic universe of the shoah was used to express one’s own deficient experience of life employing a borrowed »screen-destiny«. 1995 the Suisse Bruno Doesseker published a report on his childhood in nazi extermination camps under the pseudonym Binjamin Wilkomirski. The book met with broad international response until, a few years later, it was unmasked to be a forgery, eliciting great upheaval. The fact that the alleged holocaust survivor, using his family novel, created a new family identity as a welcomed member of the Jewish community, the author interprets as an attempt at rescue: Doesseker, who before being adopted had spent his childhood partly in foster-families and children’s homes, wrote this text during a psychic crisis. In the exuberant public reaction to the book the author recognizes the contribution of the deceived to the imposture: the idealizing misjudging the con-man as a pure and innocent victim gave them the opportunity to make up leeway – to listen to the victims – in order to ease their feelings of guilt. The article represents three spheres of activity in Käthe Dräger’s life – pedagogics, psychoanalysis and politics. She was influenced by socialist ideas already at a very young age and included them in her work as a teacher at a ›Lebensgemeinschaftsschule‹. The principles and aims of KPD(O) and Dräger’s political engagement are discussed. 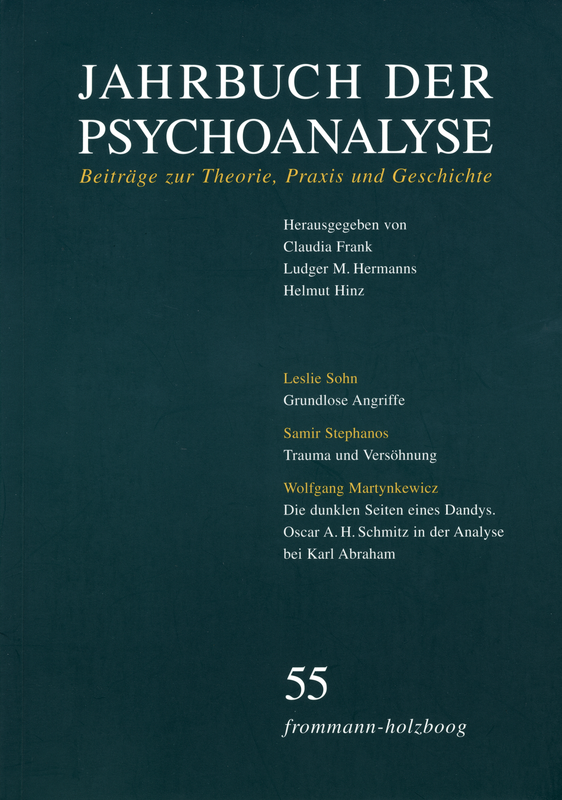 Dräger began to be interested in psychoanalysis in the early thirties and started her studies at the Berliner Psychoanalytisches Institut comprising a training analysis with Ada Müller-Braunschweig. Conflicts which arose from working illegally against the nationalsocialistic system during that time are scrutinized in detail. Her resistance is illustrated very vividly by information provided by Theodor Bergmann, a KPD(O)-comrade. After the Second World War she worked in East Berlin hoping that a new era was going to implement communist ideals. Soon she came into conflict with the Stalinist system and decided to work in West Berlin in child guidance. Käthe Dräger was a founder member of the DPV in 1950. She primarily was engaged in psychoanalytical training and organization, aiming at the rejuvenation of Freud’s psychoanalysis. This contribution presents the writer Oscar A. H. Schmitz, who was a member of the intellectual milieu of the ›Schwabinger Boheme‹ and the ›George-Kreis‹ around 1900. During the period before World-War I he spent his time in the big European cities and travelled a lot. He cultivated the attitude of a dandy and was often seen in the famous literary circles in Berlin, Paris and Vienna. Schmitz lead a dissolute life with frequent escapes into the demi-monde. The present paper shows Schmitz as a contemporary type of man in the Wilhelminian era. Behind the mask of a dandy, who claims to hold his affects in check, are hidden unbounded anxieties and an insatiable erotomania. Schmitz was interested in psychoanalysis already very early, hoping he could be cured of his anxieties and nervousness. 1907 he got to know Sigmund Freud in Vienna. 1912 Schmitz started an analysis with Karl Abraham which lasted until March 1915. The case shows an early treatment of narcissistic neurosis, which was doomed to failure in the end by the patient’s resistance and defence organization. This essay is based on the diary of Oscar A. H. Schmitz from the years 1897 – 1918, first published in 2006 and 2007. Psychoanalysis and his experiences as Karl Abrahams’ patient is the foremost subject of the third volume. Little was known about Edith Jacobson until now in spite of her fascinating life and work. The author of The Self and the Object World (1964) and Depression (1971) had participated in the rise of psychoanalysis in Berlin before 1933, braved the Nazis, was put under arrest and sentenced, had a venturesome escape via Prague to New York and became a main figure in American Ego-Psychology. The book edited by May and Mühlleitner opens a new dimension in the understanding of this eminent analyst. In presenting many unknown sources, introducing the historical contexts and painting a lively picture of Jacobson’s personal life, her political position, her contributions to theory and her practice and technique, the authors succeed in opening an affective resonance to the reader, giving him the chance of a psychoanalytic experience by reading itself. Especially notable is the quite successful cooperation of American and European authors in this book.